Boundless enjoyment. Inexhaustible winter joy. If the Romans had known how to ski, Obertauern would not have remained a simple stopping-off point. Here, a variety of pistes, rapid descents and stunning freestyle action await, with direct access from the Hotel Römerhof, the hotel in Obertauern with its own in-house ski bridge. with wonderful spring skiing in bright sunshine. Approximately 100 kilometres of perfectly groomed pistes offer variety and unadulterated adventure for all ages and levels of ability. 26 lifts - gondolas, chairlifts and t-bars - carry you to the top with comfort. Reigning supreme over the rest of the slopes is “Gamsleiten 2”, the piste descending from the Obertauern resort’s highest point at 2,313 metres above sea level. As a guest at the Hotel Römerhof, not only do you benefit from our unbeatable location, but also from additional services such as our in-house ski depot and the “Skiworld” ski rental. In addition, the meeting place of the area’s best-known ski school is also located right in front of our hotel in Obertauern. The “Spot” Fun/Snowpark is the meeting place for adrenaline lovers looking for freestyle action and a place to prove their big air skills. Located right next to the Kehrkopf 4-seater chairlift, freestyle fans can find rails, over 30 jibbing elements and 10 jumps for the ultimate in gravity-defying gratification. Welcome to the world of unlimited (snow) options. The various ski circuits are a great way to get to know the variety of slopes of the Obertauern ski world in its entirety. Complete a circuit of the Tauern “Schneeschüssel”, choosing between easy green pistes or demanding red routes according to your skill level. That’s customised skiing pleasure at its best. Every Monday and Thursday from 19.00 - 22.00, you can enjoy skiing in a different light: night skiing on the Edelweiss 4-seater chairlift allows you to practise your turns under the twinkling starry sky of the Salzburg region. 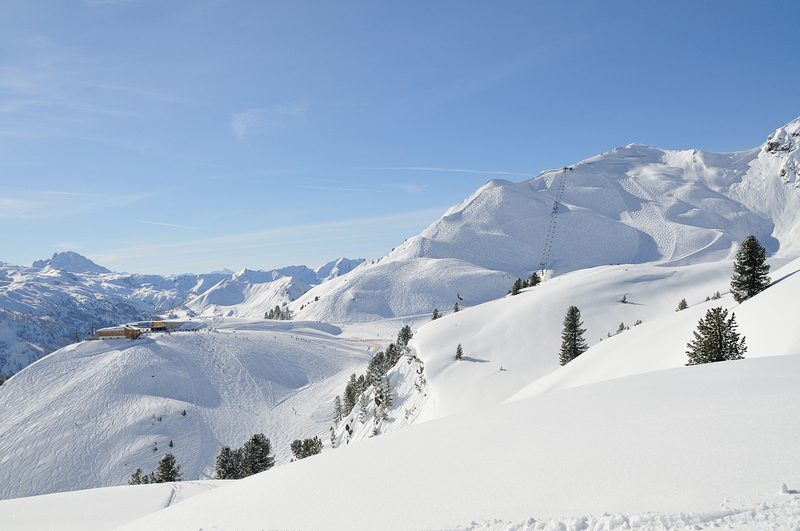 As of now, Obertauern ski passes valid for 1.5 days or longer are also valid for the Großeck-Speiereck ski area in Mauterndorf, just 15 km away. This ski area is easily reached via free shuttle buses, which take you directly to the 8-person gondola Mauterndorf valley station (1200-2400 m). Freeriders and off-piste lovers, however, will find plenty of deep powder slopes, fresh tracks and challenging off-piste terrain in the Obertauern ski area. “Obertauern free riding” is a grandiose adventure in the great outdoors, where nature and stunning mountain views really come into their own.